Ah, Euro 2012. Just because I’ve not had the time to write about it, don’t for one moment think I’ve not been following it like a proper football fan. I’m football crazy. Although still desolate without the traditional Guardian booklet with which to guide myself through the jungle of new names and managers (and too late to pick up the recommended When Saturday Comes equivalent – in two years’ time I won’t be so tardy), I’ve seen the majority of the games, except when two are playing concurrently. As is traditional, the tournament has increased my intake of beer. I suspect it’s the weather, too, but I can no more avoid falling into the cliché of a male football fan on the sofa with a glass of lager and a barrage of shouty advice for the players on the screen than I can avoid falling into the cliché of a Guardian reader going on about Grayson Perry. There is, as Perry indeed noted on his glorious C4 series about class, comfort in conformity. I have yet to watch any Euro 2012 in mixed company, and I run past pubs showing it, as I fear my deficiencies of contextual knowledge would expose me to ridicule. At home I’m safe. I have no idea, for instance, who Wellbeck and Lescott and Milner and Young play for when they’re not playing for England. I’m pretty certain that Torres and Ronaldo play for English Premiership clubs, and I can make a stab at which ones, but in one way, it doesn’t matter. I’m watching Euro 2012 for its own merits. Wellbeck plays for England. Torres plays for Spain. That’s all that matters to me. While I have vertigo-inducing respect for those that follow league football and balance and reassess its administrative intricacies at all times, as I’ve said, I don’t have the spare brain power. For me, it’s like going on holiday once every two years. (Which is ironic, as I don’t go on actual holiday even that often.) I’ve just realised I don’t know Torres’ first name. Respect me! Still, it’s a result for me personally, as I am attending a family function on Saturday night that would have been – shall we say – affected by a potential England quarter final at 7.45pm. As it stands, those who would not have been able to miss such a thing will presumably be persuaded to join the party while Spain play France, as thrilling as that would surely be. It’s never a walk in the park following England’s progress through an international championship. They have a habit of displaying bursts of promise, and then urinating that promise up the wall at a later stage. To have held France to a 1-1 draw was a surprisingly positive start last Monday, and to have provided us with three goals against Sweden from three relatively new players (completely new to me, of course, in the case of Wellbeck and Carroll, although I remember Walcott – which we are childishly pronouncing in the Germanic way for no reason whatsoever in our house – when he was Sven’s wild card at World Cup 2006 when all the famous strikers were injured) was a treat beyond our expectations. It’s amazing to see any goals, especially when teams of lofty reputation like Sweden, Holland, Italy and Germany had been coming up with frustrating results like 1-1 and 1-0 in those early games. See, I’m into it. It’s dominating my evenings and it’s causing me to leave the office early so that I can settle down in time for kick-off (or, in the case of ITV, about half an hour after kick-off, so that we can fast-forward through the adverts for betting shops – there are enough adverts during the games without being assailed by them at half time). I can confidently say that part of me wishes Wayne Rooney hadn’t been played in the Ukraine match, even though he scored the decisive goal with his extended head. I think having an iconic, talismanic player on the squad can be detrimental to team solidarity. If England “expects” one man to shoulder the whole burden, it allows the others to defer. But look at Wellbeck, Carroll and Walcott (sub) against Sweden! Out of the shadow of Rooney, they bloomed – and it looked like Hodgson had moved the chess pieces around with skill, timing and foresight. Or at least, this is how it looked from my part-timer’s sofa. I am the armchair manager’s worst nightmare: the armchair manager who doesn’t even bother to turn up for work for two years at a time! Fear me! Heavens, I’ve just written about 1,200 words on the football. Better get back to work, so that I can leave work and watch the football. I must admit, I have enjoyed watching Portugal, who have the most tattooed arms in the tournament now that Denmark and Ukraine are out, I think. Maybe there are a lot of tractors in Portugal. Come on! Even if you don’t watch Telly Addict, you have to admit, that is pun of the year. My exec producer at the Guardian asked me to step outside my “comfort zone” and review Euro 2012, but the joke’s on him, as it’s widely known that I am a two-yearly football fan and that the Euros are well in my comfort zone! So, for your consideration this week: MOTD: Euro 2012 on BBC1; Euro 2012 on ITV1; and All In The Best Possible Taste with Grayson Perry on C4. Got a bit carried away with the football, I admit, so I promise to review Punk Britannia on BBC4 next week, when it reaches its conclusion. Game Of Throw-Ins? I’m taking half a day off. Looking back on previous international football tournaments, which are my cue to become interested in football for a couple of weeks every two years, it amazes me that I somehow had the time to “review” individual matches. I’m impressed with myself. Not at the layman’s articulacy with which I captured a sport which I spend most of my life not watching, but at the sheer dedication, and at the sheer spare time I seem to have had in 2010, 2008 and 2006 (before which I wasn’t blogging). Anyway, on with my disclaimer. If I was one of those people who followed football on a religious, weekly basis, I would find me irritating or even heretical. But please don’t. I won’t be standing in a pub pretending I know all about football for the next couple of weeks. I won’t be pretending anywhere. I’ll be at home, watching the matches, and only supporting England through geographical accident of birth. I shan’t be painting my face. I am already following their progress with interest and enthusiasm, but not to the point where I will fly a flag (I think you know how I feel about the flag), or weep when they go out. I actually like watching the other teams more. During the World Cup I became particularly fond of the African and Eastern European nations. I liked both France and Italy in 2006, and enjoyed the final – until Zidane did “the stupid thing” – without partisanship. I do not hate the Germans, either. I enjoy the nature of the TV coverage, identifying the voices of the commentators and pundits, picking up on their cliches, and I love the roar of the crowd, even when it’s through the speakers of my TV. You won’t find me watching football in public. But I do cheer and boo at home. Especially if I’ve had a small beer. And I do shout at the screen. Here is my review of the 2006 World Cup final. If you scout around previous entries at that time, July 2006, you can read other reviews and get a flavour of how a football lightweight covers such a tournament. Also, Euro 2008 is covered; just look up June 2008 in the archives over there on the right. As I say, I’m quite proud of my efforts looking back. I wrote a series of “essays” for the 2010 World Cup – “essay” being a subtle pun on SA, South Africa. The first is here, and the rest are nearby. I won’t be “reviewing” matches this year, as I simply do not have the luxury of time. I’m busy writing two pilot scripts for two broadcasters and when I’m not doing that, writing bits and pieces for Word, and writing my Guardian TV review, and writing things for Radio Times. I’m jealous of myself in 2010, 2008 and 2006 for having the time to write so many words for free, for myself, for fun. I am, however, enjoying Euro 2012 and will be “reviewing” it for Telly Addict this week, with clips! So far, I’m fascinated by how many players have one entire arm covered in tattoos, usually the left, although I think the Republic of Ireland’s Glenn Whelan has his right arm covered. I feel sure this has increased since the World Cup. See? That’s the fun of only watching football every two years; it’s like not seeing a niece or nephew for that amount of time and noticing changes that would be imperceptible to others closer to them. When the BBC’s Alan Shearer came on for the first time, for a split second I thought they’d sent his dad. Oh, and I’m really enjoying what feels like a pretty new England team, while they’re still in the competition. So many names and faces I’ve never seen before! Wellbeck! Lescott! Young! The improbably-named Oxlade-Chamberlain! I pity the rest of you, with your rolling knowledge. Written by Chris Chibnall, a quiet master of popular television with Torchwood, Born & Bred, Life On Mars and Law & Order UK under his belt, and directed by James Strong, expanding his portfolio after similarly glossy fare like Doctor Who and Hustle, this was an economical, intelligent and respectful slice of history that avoided the sporting drama’s most voracious trap: dramatising actual football, which can’t be done. Deftly, whenever the Busby Babes went out onto the pitch, we left them to it, a simple captioned scoreline providing the result. We saw the actors training, and kicking a ball against a wall, but at no point did we see a football match recreated. That is fancy footwork. It wasn’t about football, it was about camaraderie among men, and how loss of life affects it. It was more like a war movie than a football movie. Tennant dialled down the eccentric face-pulling that people love him for and brought a knotted brow and grim determination to the Welsh coach Jimmy Murphy, who wasn’t on the fateful chartered jet that failed to take off in the snow in Munich on 6 February, 1958, on its way back from Belgrade to Manchester, but was pivotal in keeping the team together after the terrible tragedy that befell them at their peak of youthful fitness. With Dougray Scott clearly relishing the part of Sir Matt Busby – now there’s an actor who’s becoming more interesting now he’s out of his heartthrob phase – and the solid likes of Dean Andrews, Tim Healy, Neil Dudgeon, Melanie Hill and Kate Ashfield making anybody who watches TV drama feel they are in the safest of hands, United was quality product. I understand a traumatised Charlton really did find the inspiration to get back in the game by having a kickabout in an alley with some local kids, so the film’s perhaps most melodramatic moment actually happened. How about that? 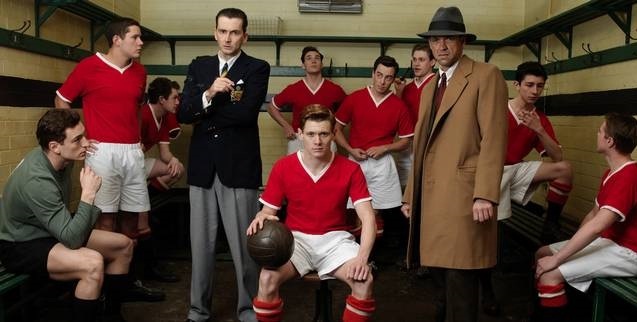 I’m sure other scenes were more fictionalised – and I know that the relatives of Sir Matt Busby felt United‘s portrayal of the man was less than three-dimensional – but you have to accept a certain amount of artistic licence in dramatised events. The point is, Chibnall, Strong, the fine cast and composer Clint Mansell – whose restrained but moving score felt period, too (nice to see him playing a home game for a change) – captured the feel of a moment in time. The look of the old boots, the sound of the old ball hitting a wall, the thick-framed specs perched on noses, the pint glasses with handles, the caps and overcoats, the birth of the “glamour” club … it’s all in there. I’m guilty of overstating the case for American TV drama – and it’s true, they own the 22-week series, because it’s their gig – but you’d be hard pushed to find a one-off as focused and fair as this one. It’s the kind of piece I aspire, or dream, to one day write. Maybe I’ll do Northampton Town FC’s journey from the fourth division to the first, and back down the fourth again, in successive seasons in the 60s. I might have to dress that one up a bit though. And get somebody as famous as David Tennent to be in it, as manager Dave Bowen, who was Welsh. He can do Welsh.